Yesterday Kirsan Ilyumzhinov announced that after 23 years as FIDE President he won’t be standing for re-election this October. The writing had long been on the wall, with Ilyumzhinov crippled by US sanctions, scraping together an election “ticket” that included a fictitious person and finally abandoned by the Russian Chess Federation and government, which have thrown their weight behind Arkady Dvorkovich. We’re currently heading for a 3-horse race, with Dvorkovich taking on Georgios Makropoulos and Nigel Short. I’ve taken the decision not to nominate myself this October at the next FIDE Congress for the post of President of the organisation. I support the candidacy of Arkady Dvorkovich for the post of FIDE President. The beginning of the end for Ilyumzhinov came on the 25th November 2015, when he was placed on the US Treasury’s sanctions list “for materially assisting and acting for or on behalf of the Government of Syria”. He made a lot of noise about overturning that decision, but there was never any reason to expect that might happen unless Donald Trump annulled all Russian sanctions. When he recently boasted about winning libel suits against some media outlets that was only possible because they’d mixed him up with other individuals sanctioned on the same day specifically for facilitating the Syrian government buying oil from ISIS. Since the sanctions would cripple FIDE’s ability to operate (Kirsan was prohibited from using the US financial system), he withdrew from an active role in the organisation, passing his powers to his deputy Georgios Makropoulos. Kirsan didn’t stop travelling the world as the visible face of FIDE, however, and last year the arrangement broke down. Ilyumzhinov’s old allies lined up against him, and when he ended an emotional March 2017 FIDE Presidential Board meeting by repeatedly saying, “I resign”, the FIDE website was quick to report on it. Ilyumzhinov backtracked on his resignation, though the minutes of the meeting were published a year later on the FIDE website in an article entitled, The Schism between Kirsan Ilyumzhinov and the Presidential Board. For a glimpse of how dysfunctional the organisation has become you can’t do better than read through those minutes. In October 2017 the board passed a motion requesting Kirsan not stand for re-election, but since he ignored that they also reported Ilyumzhinov to the FIDE Ethics Commission, which would have had the power to stop his candidacy. To add to the pressure, UBS Bank in Switzerland closed FIDE’s account in April, with the treasurer claiming it was due to Ilyumzhinov being on the sanctions list. 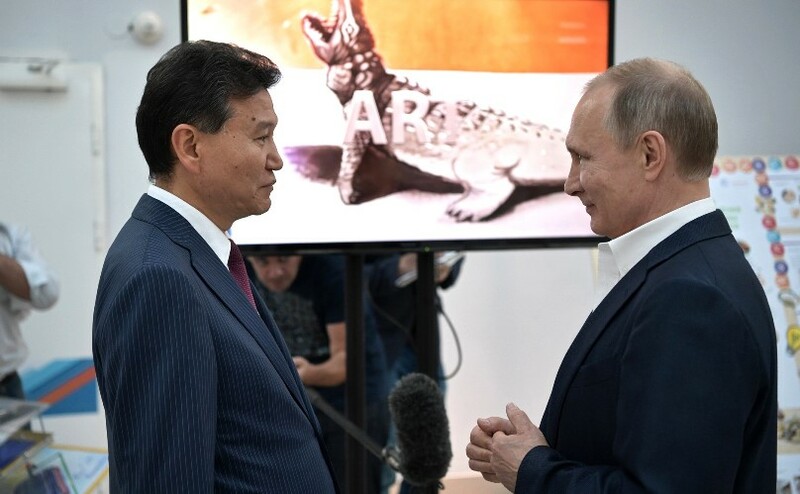 That might still not have been the final nail in Kirsan’s coffin, however, since initially he did gain the support of the powerful Russian Chess Federation to be their nominee for president. There was a proviso, though, with billionaire Russian Chess Federation President Andrey Filatov commenting, “if his ticket changes we may refuse to support him”. At about the same time Ilyumzhinov’s candidacy was descending into farce as a supposed member of his ticket, “Glen Stark”, was exposed as a transparent and barely explicable fiction. Russia and the Russian Chess Federation decided something had to be done, and brought in Arkady Dvorkovich. When the federation voted 22:2 to select him to be their candidates it was finally over for Ilyumzhinov. So how will history judge Kirsan? Well, in pure chess terms, perhaps not so badly. He came to power at a low ebb for chess. Garry Kasparov and Nigel Short had recently broken away from FIDE to play their 1993 match, leaving the World Championship system in disarray, while his predecessor, Florencio Campomanes, was widely considered corrupt. Ilyumzhimov drew much criticism for introducing the knockout World Championship system and for reducing time controls, but when rebranded as the World Cup the knockout became a great success, while the “FIDE” time control (90 minute for 40 moves, then 30 minutes to the end of the game, with a 30-second increment from move 1) is now considered a good standard for most events. The World Championship title was finally reunited when Vladimir Kramnik played Veselin Topalov in Elista in 2006, and players such as Boris Gelfand have welcomed the fact that after long years of chaos they again had the chance to compete for the World Championship title. In September they transferred part of the sum, promising a final settlement by the New Year. I wait. 10th December, 20th, 30th – silence. On the morning of the 31st the telephone rings: “Alexander Khalifman?” “Yes” “Kirsan Nikolayevich asked me to give you something. How can we meet?” I give the address – at the time I was living on the outskirts of St. Petersburg. “Next to the house there’s a bus stop. I’ll be waiting there”. I go out to the bus stop and it’s snowing – fortunately. A jeep brakes, a serious guy in a leather jacket gets out: “Kirsan Nikolayevich always keeps his promises!” He drags out a case – and puts his foot on the gas. What was in the case? As in a gangster film – bundles of dollars. All of the due amount – around 400,000. At home. At the bus stop I was smart enough not to open the case. As that story perhaps implies (and more examples could be given), the real issue was always where the money came from. When Kirsan’s 17 years as President of the Russian Republic of Kalmykia came to an end in 2010 the Russian press briefly seemed to have concluded he’d lost Kremlin support and released a torrent of criticism of his term in office. They detailed the possibly corrupt ways in which he’d amassed a fortune, documented a failure to live up to his promises for the impoverished region and even speculated that if he failed to remain head of FIDE he’d no longer have immunity for crimes committed over the last two decades. Please note: An earlier version of this article mentioned a story about Makropoulos losing part of the Las Vegas prize fund in a casino. We have no reason to believe this took place and apologise unreservedly for including it. 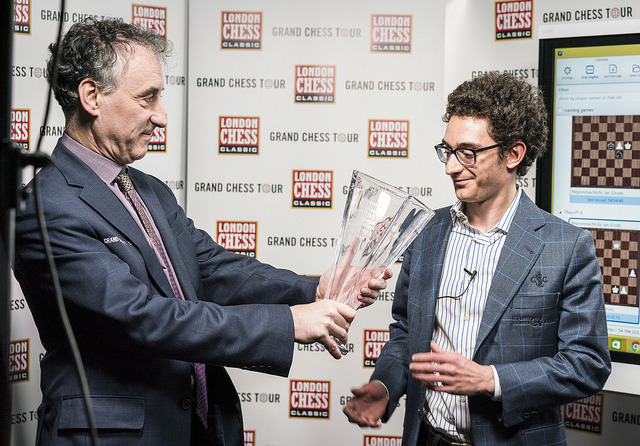 IM Malcolm Pein: Malcolm is the Chief Executive of the Chess in Schools and Communities charity in the UK and will this year organise the London Chess Classic for a 10th year in a row. He knows the chess world both from a player’s perspective and in its commercial aspects, and will be well-placed to negotiate a potential collaboration between FIDE and the Grand Chess Tour. His insistence that things should be above board was evident in ensuring that Jaime Aguinaldo from Angola, originally intended to be Vice President, was removed from the ticket after allegations of corruption surfaced. Many would consider Malcolm an excellent candidate for FIDE President himself. Experience: Makropoulos first became a FIDE Vice President in 1986, 32 years ago, and for 22 years now has been the Deputy President. If anyone knows how to control the organisational machinery, it’s him. The status quo: The downside of being involved with FIDE for so long is that if there are criticisms to be levelled at the organisation, and there undoubtedly are, then Makropoulos has to take responsibility for them. He ran the organisation and was instrumental, with his allies, in keeping Kirsan in power. In fact serious commentators such as Boris Gelfand have long held that Ilyumzhinov was a largely positive figure, in contrast to his deputies. Ilyumzhinov has already gone: Malcolm Pein’s first justification for standing on Makropoulos’ ticket was that we had to remove Kirsan at all costs before we could set about rebuilding FIDE. Now that’s already been accomplished before the election he’s had to pivot to wanting to provide an alternative to a Russian-supported candidate. Not the status quo: Though Nigel has been involved in previous presidential races - and therefore can’t claim zero involvement in the kind of dealing that saw Garry Kasparov draw up a contract for Ignatius Leong to bring him votes in return for funding – he’s largely untainted by chess politics and association with the current administration. He’s in the best position by far of the three candidates to suggest that he can offer real change and a team unlikely to scare off potential sponsors. Diplomacy isn’t Nigel’s strong suit: Diplomacy is obviously a useful skill for a role involving balancing the interests of almost 200 countries, but Nigel, like Garry Kasparov before him, is much better known for speaking his mind. Most infamously, his obituary for Tony Miles included the detail that he slept with the deceased’s girlfriend, while more recently he was at the centre of a media furore over comments about female players and chess. That was somewhat blown out of proportion, but if Nigel does become FIDE President he’ll have to watch his words more carefully. Professionalism: Arkady Dvorkovich is a serious political figure, who from 2012 until last month was Deputy Prime Minister of Russia. Since March he’s been the chairman of Russia’s organising committee for the FIFA World Cup, while in terms of chess Dvorkovich also has an exemplary CV. His father was an international chess arbiter and during his time in charge of the Russian Chess Federation he ran the Tal Memorial supertournament. He knows how to handle sponsors and the media, and seems set to adopt a more professional approach than his rivals in campaigning for the role of FIDE President. Bringing on board such well-known chess players as Julio Granda and Zhu Chen is also a positive surprise. Resources: The Russian supported candidate for FIDE President is sure to have Russian embassies around the world lobbying on his behalf, but the more positive resource for chess is likely to be his connections and the potential to bring money into the game. 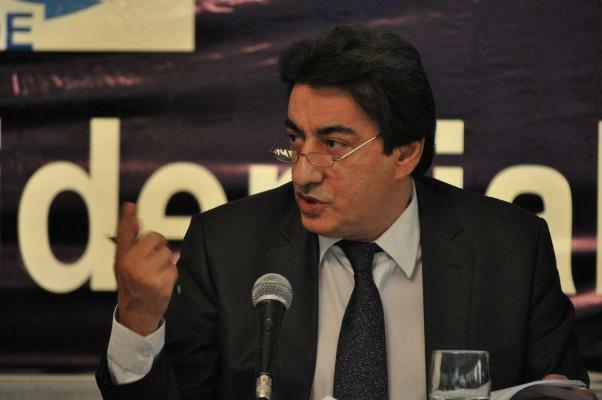 Add Mahir Mamedov, who as the Director of SOCAR Energy Georgia has brought more money than anyone else into chess in the last decade, and it’s currently not clear whether the other two presidential candidates will be able to compete. The Russian factor: While we’ve already flagged up the potential for funding from Russia, there is of course a serious downside. Under Kirsan Ilyumzhinov, and particularly his ill-fated venture with Agon, we ended up with the World Championship cycle only funded by Russian companies and prize funds reduced to the bare minimum allowed. While there’s a good chance Dvorkovich might break the link with Agon and find serious sponsors instead, too close a tie with Russia is likely to scare off international companies, with Dvorkovich himself under threat of being placed on a US sanctions list. Dvorkovich also supported Ilyumzhinov: Once again it’s hard for Arkady Dvorkovich to separate himself from FIDE’s past, since he was instrumental in keeping Ilyumzhinov in power for so long. Most notably, in 2010 he managed to reverse the Russian Chess Federation’s nomination of Anatoly Karpov as their candidate for FIDE President. The problem with Karpov, from a Russian government point of view, was that he was being supported by Garry Kasparov, an outspoken critic of the Russian regime. As always with chess politics, it’s hard to know what’s really going on, and traditionally the outcome of FIDE elections is more about bribery and corruption than any meaningful battle of ideas and programmes. It wouldn’t be a large surprise if the Makropoulos and Dvorkovich camps suddenly coalesced around a single candidate, who would then be almost guaranteed to crush Short’s lively but probably underfunded campaign. Or we might see a bitter battle between Makropoulos and Dvorkovich, with Short playing the spoiler. We’ll keep you informed – but perhaps not too often. 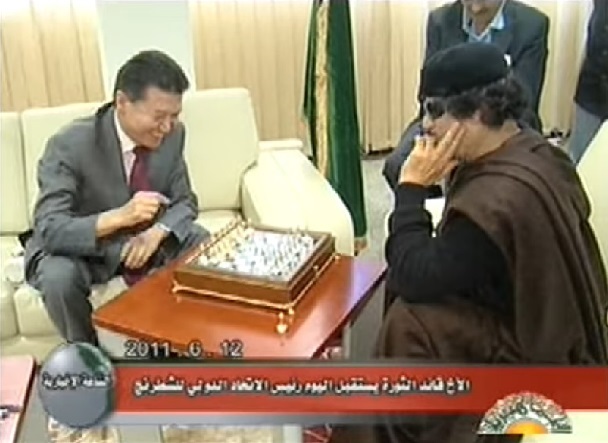 There’s only so much chess politics anyone can handle!